The researchers found that products chosen for classrooms differ markedly, from Chromebooks’ emergence as the technology of choice in more than half of U.S. classrooms to support digital assessments and personalized learning, to the growth of different mobile personal computing devices in other parts of the world. Futuresource found that, in countries where teachers continue to stand in front of the class for instruction, display devices are more prevalent. That accounts for the fast growth of interactive flat panels in China, and interactive whiteboards in Spain, Italy and Russia. In 2015, over 2.5 million interactive displays were sold. The volume of interactive flat panels more than doubled, with new models and new vendors entering the market. 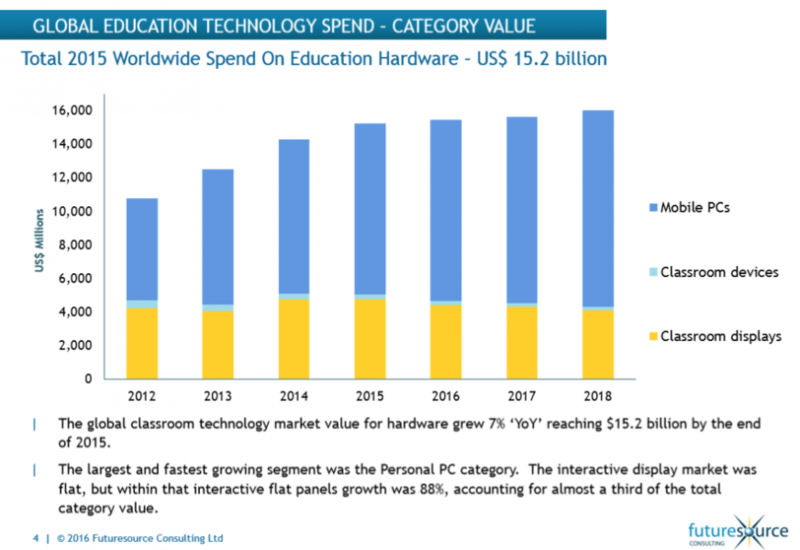 The mobile computing market, at $10.1 billion, has driven much of the increase in funding spent on ed-tech hardware, according to Futuresource. It now accounts for 67 percent of total spending in this category, a 4 percent increase over 2014. Thailand, India, Mexico and Venezuela have all deployed significant projects, the company found. Chromebooks were the biggest growth category within the personal computer segment of the market, increasing more than 42 percent in revenues year over year, and generating more than $1.5 billion in 2015.